Today I just discovered a splendid new property in Umbria. It is a castle that was completely renewed last year and features several properties independent from one another. The name is Casale Il Poggetto. The castle is from the middle ages (12th century) and used to be the residence of lords that used the properties at Poggetto as their hunting residence. The castle was destroyed by the Pope in the 15th century for political reasons, then rebuilt over the ruins immediately after, and it still preserves structures from the original building. 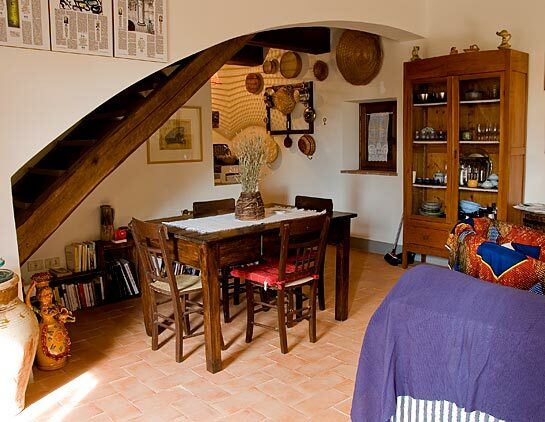 The old barn and turret are now independent apartments in Umbria, each one separate from the castle, and independent from one another, completely furnished with lovely rustic style, fine antiquities, and modern appliances for a holiday in Italy with all comforts. Casale il Poggetto apartments in Umbria is located in Todi in the middle of splendid nature settings, woodlands, and hills with great charm and perfect to relax. All apartments are greatly romantic, and the outdoors offer spaces to enjoy the warm Italian weather in an oasis of peace during al fresco dinners. If you are looking for a romantic stay in a castle in Umbria, renting apartments for couples or for families, you should really check out apartments Umbria Casale Il Poggetto, as its prices are just as excellent as its quality and charm. A perfect location for both summer and winter vacations in Italy.